Have you ever become visually numb to the places you pass on a daily basis? I think we all do. That is why it is not all that surprising that many of the staff in our museum are not aware when we make a relatively large shift in Spark!Lab. With a passing and distant glance at Spark!Lab, you might notice some colors or shapes that appear to have changed since you last noticed the space. If you choose to venture in, you will see that text, signs, and activities are different. The changes are complete and all encompassing. Every four months we do what we call an "activity theme transition." If you are reading this and are curious about all of the activities we have done through all of our transitions, visit https://invention.si.edu/current-sparklab-activities. While our current activities are front and center, our past ones are archived on the right side of the webpage. I have to admit, when I look at the current and past lists, I think to myself, we have made a lot of changes. At the same time I think, with these changes, we have the potential to encourage hundreds of thousands of future inventors who have so many different learning styles and interests. We have a big, though informal, responsibility to make each theme engaging and exciting. Our latest transition was from the theme “Play” to the theme “Go.” The “Play” activities have been a hard act to follow. Through the years, our staff has developed tools to identify and codify our activity types, leading me to make a conscious effort to include certain elements as I create for the space. With each set I try to work out something creative, a few building activities, and something that is likely to be iconic. This is not an ironclad formula, but was the trend as we opened this iteration of Spark!Lab in 2015. Over the years, it really seems to have stuck. The variety we provide allows us to reach a range of young inventors with different interests and learning styles. It also gives each set an option-filled, homogenous feel. Let’s look at some of the now and then from the last theme transition. During “Play,” our decidedly creative activity was Create a Costume. For “Go” the creative activity, though it tends to act more like a mechanical building activity, is Design a Shoe. The current shoe activity is an exercise for us in combining fabric, 3D-printed parts, Velcro adhesion, and silicone casts. For visitors it has been a chance to invent with our prototypes while informing us about the approach of the Shoe activity. What we learn here will certainly translate to future activities. The key building activity for “Play” was Invent a Rolling Toy. For “Go” the parallel activity is Invent a Vehicle. The rolling toy activity used K'nex and small scale wheels for building on a table top. 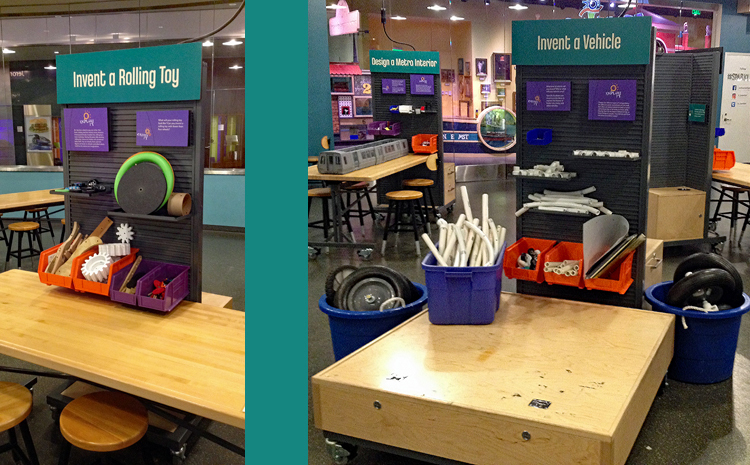 The Invent a Vehicle activity uses large-scale PVC tubing and wheels for building large inventions on the floor. Both are the same idea but with different materials and different outcomes. Invent a Vehicle is also an activity that we send to our Spark!Lab National Network sites. Having the activity in our space is allowing us to explore facilitation techniques as well as materials that we can use to augment the activity. Lastly we will look at my favorite, the iconic activity. This activity is meant to look totally different from anything you may have seen in another museum. The iconic activity is usually the one that I personally put the most work into. We try to always put the iconic activity near our front window. During “Play” it was Tweak a Pinball Game. For “Go” it is Design a Metro Interior. 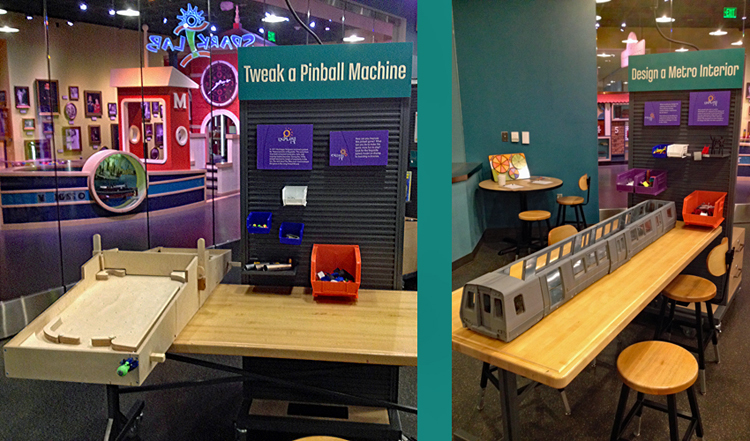 The Pinball activity consisted of 4 wooden pinball games attached to a large table. The Metro activity centers on a meter-and-a-half-long Metro train model where you build the interior with magnetic toys. 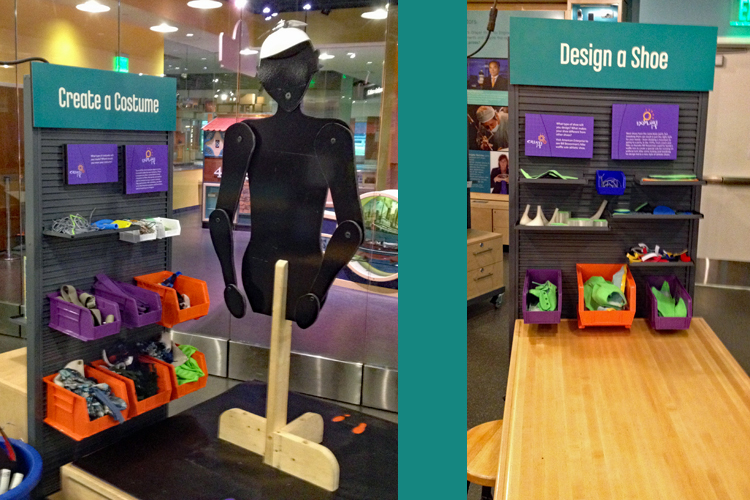 Both activities are eye-catching and both have proven to be a visual draw and very engaging for our visitors. A passing glance may not reveal the breadth of the latest then-to-now change in Spark!Lab. It is not until you immerse yourself in the space and try the new activities that the change becomes evident. For us, it is an ever-changing canvas to explore how people learn. Each transition brings new favorite activities, new moments of connection for our visitors, and a refreshing update to the space. I would like to invite everyone to come see what we have now and, if you can come back after the next change, to see what comes next.